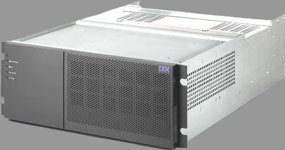 The IBM TotalStorage DS4400 (FAStT700) is a high performance 2Gbps FC storage server. Using (16) EXP700 or (16) EXP100 expansion enclosures, 224 physical disk modules can be installed in redundant loops with the DS4400's dual controllers. 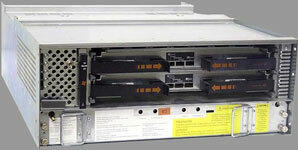 With the appropriate intermix licenses, SATA and Fibre enclosures can be installed in the same loop. A maximum storage capacity of 112 TB is attained with (224) 500GB SATA disk modules. With appropriate firmware updates, 300GB 10K FC disk modules can be installed as well.